ES-EST Clear Coil Sound Tube with tips. 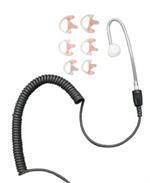 Listen only earpiece with sound tube, clothing clip and mushroom tip. 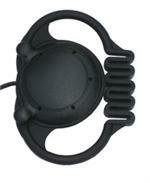 ES-MLD Non-occluded Ear Mold with Sound Tube. 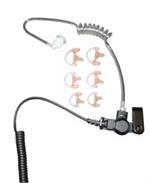 Listen only surveillance earpiece with sound tube, clothing clip and mushroom tip. Black coiled cable. 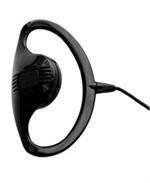 ES-MLD003C Sound Tube Earpiece with Non-Occluded Ear Mold. ES-ILT Listen Only Earpiece with Short, Straight Sound Tube, Coiled Black Cable and Connector. 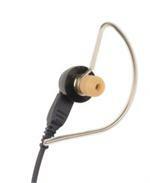 Listen Only Earpiece with Short, Straight Sound Tube, Coiled Black Cable and Connector. ES-ILM Listen Only Earpiece with Short, Straight Sound Tube, Coiled Black Cable and Connector. 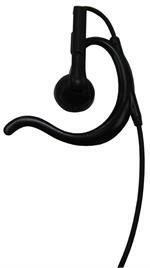 ES-BUG Earphone puts the comfort of an ear bud with the added security of an over the ear rubber hook. ES-MUR Earphone places the speaker at your ear, not in it. 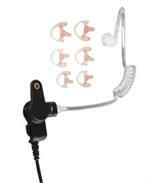 The ES-MUR Earphone is noninvasive and hygienic, placing the speaker near the ear. The plastic shell is extremely lightweight for all day comfort. OK-EM101 earphone fits comfortably around the ear. ES-ASP Announcer Style earphone is a rugged unit with a coated wire retaining loop and silicon eartip for a secure and comfortable fit.